MCM eyewear - Bold shapes, exclusive detailing, & artisanal finishing. 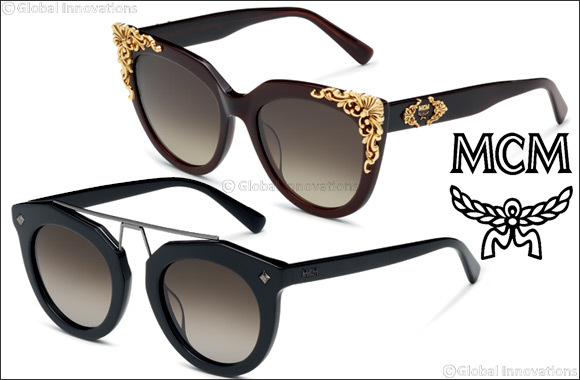 Dubai, UAE, August 29, 2017: MCM (Modern Creation Munich) presents a new Eyewear Collection which celebrates the brand’s luxurious, non-conformist and innovative spirit. With bold shapes adorned by exclusive detailing and artisanal finishing, the collection’s classic influences are brought up to date with contemporary style and a timeless design. These unisex sunglasses – which were unveiled as part of the brand’s new advertising campaign – feature unique round frames in acetate. The model is embellished with a bold double bridge in metal, the design of which is inspired by the geometric shape of a cut diamond. Meanwhile, luxurious gold decorations adorn the front section and temples, which also feature the MCM logo. Presented in a range of luxurious acetates in which color merges with metallic veining and bold tones. Available in Black, Havana Blue, Havana Purple, Streaked Beige and Mauve. These wide, mask-style frames with raw-cut lenses feature dual profiling in metal and acetate around the rims and down the temples, which feature a “half-diamond” hinge. The use of two colors and two materials to finish the frames is indicative of the brand’s desire for femininity, sophistication and absolute class – qualities reflected in the engraved logo on the left-hand temple. The geometric shape of these women’s glasses is underlined by the combination of acetate and metal, creating an elegant – yet bold – look. The front section and temples are adorned with tiny metal screws which serve as a purely decorative element as well as creating the brand’s logo. Meanwhile, the lenses are framed with sleek golden profiling, emphasising the contrast between the various materials. The frames are available in two versions featuring the iconic Visetos pattern. Available in Black, Black Visetos, Cognac Visetos and Red. This opulent women’s model in acetate has a cat-eye silhouette characterised by elegant baroque-style decorations on the front section. The shape is extremely feminine and seductive, with luxurious detailing in both the gold and silver finishing. The brand’s logo is prominent on both temples. Available in Black/Havana, Dark Havana/ Havana and Horn-effect Blue/Havana. These unisex optical frames – which are featured in the brand’s new advertising campaign – use acetate to adorn its geometric shape, both straight and curved. The front section is decorated with a slender metal bar fixed in place with tiny shaded screws. The same finish is applied to the MCM logo, which is applied to both temples. Original horn-effect streaks feature in both color variants. Available in Black Havana, Horn-effect Brown/Havana and Blue-effect/Havana.